Lapidary Journal started out as a Rockhound and Gemstone Magazine and converted to Jewelry Arts in the later '90’s when they began to focus more on Jewelry than on rocks and minerals. It is a beautiful magazine and a wonderful resource. Lapidary Journal,/Jewelry Arts is published 12 times a year, The April issue is usually the Bead Issue, which often runs to 200+ pages, and may require extra postage. The list below indicates how many issues we have for each year, and the preset packaging. To order, or inquire, please copy and paste or write in the entire line starting with the Letters LJ in your email. If there are fewer than 12 issues, and you would like to order the all of remaining issues there will be a 10% discount n the total price. We do not sell single issues. PLEASE NOTE: THERE IS A FLAT RATE SHIPPING CHARGE OF $6.50 FOR EACH SET, UNLESS THEY CAN BE COMBINED. LJ1992 Set 1: 3 issues: Oct, Nov, Dec. $10.50. 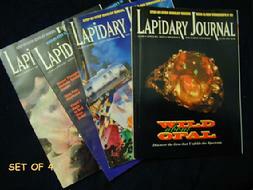 In 2000, Lapidary Journal added Jewelry Arts as a sub title. including more articles and How-to’s specifically designed for Jewelry makers. changed even more to an emphasis on jewelry making.